For the last couple of years, Kitchen Gardener's International has been organizing Food Independence Day on July 4th. The idea is to create a local, sustainable feast on this national holiday celebrating our country's independence. Independence Day really can be more than once a year. What's more patriotic than self sufficiency and supporting your local community? I see growing my own food and buying from my local farmers and at local farmers markets as an important part of my independence. In fact, the Eat Local Connecticut Challenge fits perfectly into this whole idea of food independence. Supporting my local farmers feels like the right thing to do, plus it's delicious. Independence tastes good! So, without further adieu here are my latest challenge meals. In a small bowl I mixed together about 1 tablespoon of fresh chopped oregano, 1/2 tablespoon of fresh chopped chives, zest of 1 lemon and 1 lime, juice from half the lemon and half the lime, 1/4 teaspoon of ground cayenne pepper, 1/4 cup yogurt, salt and pepper to taste. I placed two chicken breasts in a shallow glass container and poured in most the yogurt marinade, reserving about 1/3 of it for later. I covered the dish with plastic wrap and put it in the refrigerator for 45 minutes to let the flavors soak into the chicken. Then I tossed the chicken onto the grill. 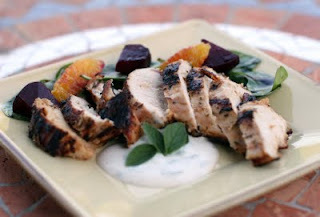 When the chicken was cooked, I sliced it and drizzled on the reserved yogurt marinade. In the meantime, I boiled four beets. When I could pierce them all the way through with a fork, I pulled them from the pot and let them cool, then removed the skins. I chopped them into bite-sized pieces and put them in a medium sized bowl. I cut the peel from an orange, then sliced it. I tossed that in with the beets along with a couple tablespoons of balsamic vinegar, olive oil and a pinch or salt and pepper. On a large plate I arrange two cups of fresh spinach and spooned on top the beet and orange salad. For the ultimate cookout holiday we went meatless. Yes, that's right. No burgers, no hot dogs, no meat. Just vegetables. Crazy, right? You know, it was perfect. The produce was so fresh we just wanted to savor it in all its glory. A drizzle of olive oil, a few pinches of fresh chopped oregano and rosemary, a pinch of salt and that's it. 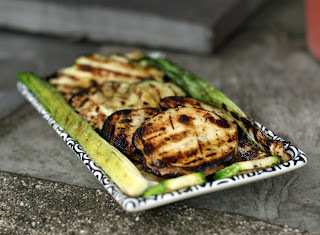 We grilled them up, and while it may not make for the prettiest photo, they tasted great. For the leeks we charred them a bit, then wrapped them in foil and put them back on the grill to get extra tender. Once the scent of leeks filled the air, we pulled them off the grill and drizzled on some homemade honey mustard vinaigrette. I love the taste of spicy mustard with leeks. The holiday celebration just would mot have been complete without dessert! Of course, I had to go with the red, white and blue theme. 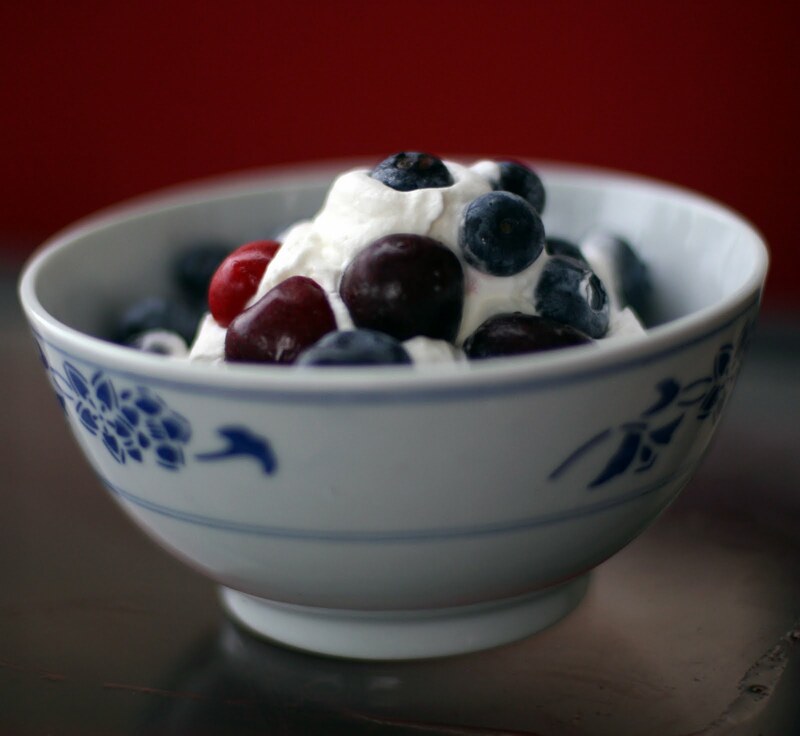 A bowl of blueberries topped with homemade whipped cream and a few sliced cherries was the perfect way to round things out. So, what's been cooking at your house? I'd love to hear about your recent local food finds.